Today I’m flying from Los Angeles to New York to start my reserve rotation for May. I’m bringing my son along with me. He’s two. Because my husband travels on business often and I’ll be on-call, my son will be spending eight days with grandma and grandpa. Oh sure I’ll take the train out to see him in-between trips. That’s not the problem. The problem is with all this talk about swine flu, I can’t help but be a little nervous, not for me, but for him! So what am I, the flight attendant, required to do if I see a passenger who may be exhibiting swine flu like symptoms? 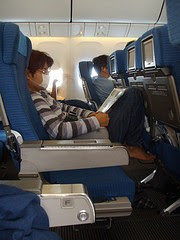 Click here to go to GALLEY GOSSIP:SWINE FLU ON THE PLANE and find out!